Should You Over Cuddle Your Baby? If you have had a baby or know someone that has a baby, you will know that there is this unknown in baby cuddling… Should you hold the baby when they cry, should you not… So many questions, some fear that not holding them will result in attachment issues and other from the other spectrum believe that over holding them will result in attachment issues. Tough one right? It is, but recent BC studies have shown that fussy babies that are cuddled regularly are more likely to develop normally than those who are cuddled the least. I have friends with babies and this article struck me. To be honest, I am glad to read this because although I do not have children, this particular question has always caught my attention. You can potentially ruin your child’s personality if you make one wrong move. There are so many ifs and buts, there are so many whys and hows, so many what should I do and what consequences am I looking for. I can rest at least reassured that you really should not ignore a crying baby … imagine how they must feel, they are crying for comfort, and no one is coming, as a new born. I can imagine myself as an adult, crying in my room and my family completely ignoring me. That would alter me, that would ruin me, it would affect my trust in my family, in anyone, it would nurture resentment, independence, lack of trust, and so much more. So as I stand today, I will never ignore my baby, I will never let my blood cry on their own while I purposely ignore them. It is so sad to think of what they may be thinking and not even able to express themselves verbally. Maybe they had a really bad dream and just need that reassurance, maybe they are babies that had something happen to them in the womb and need to be comforted until they can be more independent on their own. Never ignore your baby when they are crying, no matter how fussy they may be. Support your baby, support their healthy growth, love them unconditionally. Put yourself in their shoes for a few minutes, imagine every scenario…. Do you have the heart? Your flesh, your blood, your baby. The thought makes me so sad. Short on Time? I’ve Got Your Breakfast! Breakfast is the most important meal of the day, and you must have heard this many times, just as the saying, An apple a day keeps the doctor away. It is True, Breakfast is the most important meal of the day. It is what makes you have a bad day or a good day. It is what makes you have an energetic workout or a bad/no workout. It is also what speeds up your metabolism or slows it down. Life is all about the good and the bad, and skipping breakfast is one of those bads. So, if you have no time, you feel rushed, you can’t even imagine how you can wake up so early to make breakfast. I have got the link for you. You don’t need to wake up hours before to make your breakfast, you can prep in bulk or make some quick recipes. My personal favourite is the Savory Oatmeal With an Egg. But as far as an easy go. I usually keep some toast at work and avocado, I would prep some boiled eggs for few days and when at work, put a peace of toast in the toaster, mash my avocado and add boiled egg on top with a touch of black pepper. There is overnight oatmeal which is always a go. making quiche for the week or breakfast muffins is always a good match for those literally unable to make breakfast in the morning. YOUR OPTIONS ARE HUGE, Don’t skip breakfast, it is too important. Hope you have enjoyed my list. Making healthy food can be very timely and this causes us to eat unhealthy easy to make foods such as quick fixes or take out… even more unhealthy on average. The healthiest is to prepare and be aware of what you feed your body. Here is a healthy and useful tip that you can easily incorporate into your life. 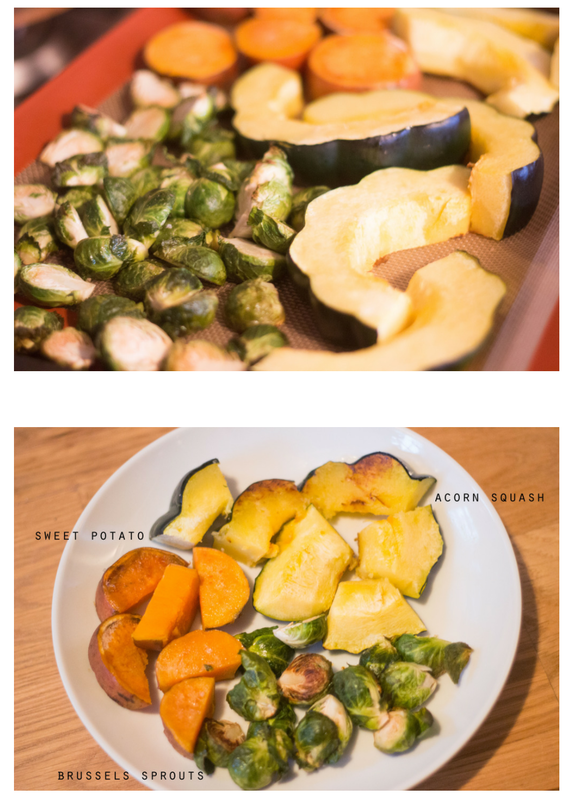 Roast your veggies and add them to all your meals. Because it’s that easy and that healthy!